Welcome to My Creative Time's 5 Days of Christmas! We've got lots of fun projects for you this week, just in time to get your creative juices flowing for Christmas! Today I made a fun tag, using one of the Stitched Postage Frame Dies to create my frame base. I then used my favorite Fun Stitched Ornaments & More set to make a few tree boughs and a cool 3-D ornament! To make the ornament, I die cut it three times, scored each in the middle and adhered them together to give it that dimension. "Joy" was made with a die from Holiday Tags. I love the different shape of this pretty tag! OMG Miss Katie What a Gorgeous Tag. I am loving your ornament loving the 3D of it all...thanks for sharing your recipe ...Great idea using the postage tag die for your tag....you had a vision and it all came together for a Spectacular tag...You so did a Super Outstanding Creative job!! YOU so ROCK!! Very pretty tag! I really like the paper you used for the ornament, and the bough die looks great on your tag! I love the pretty ornament!! Such a stunning tag!! Awesome job! Wow! I love so many things about this tag! The 3D ornament, the postage stamp backgrounds, the fun papers you chose! Love it! Love the 3-d effect of the ornament. Very pretty with the tree bough and the 3 D ornament. Fabulous tag! Love the spring and ornament. what a pretty tag. Love the ornament. Oh, you clever girl! Fabulous! Beautiful tag! 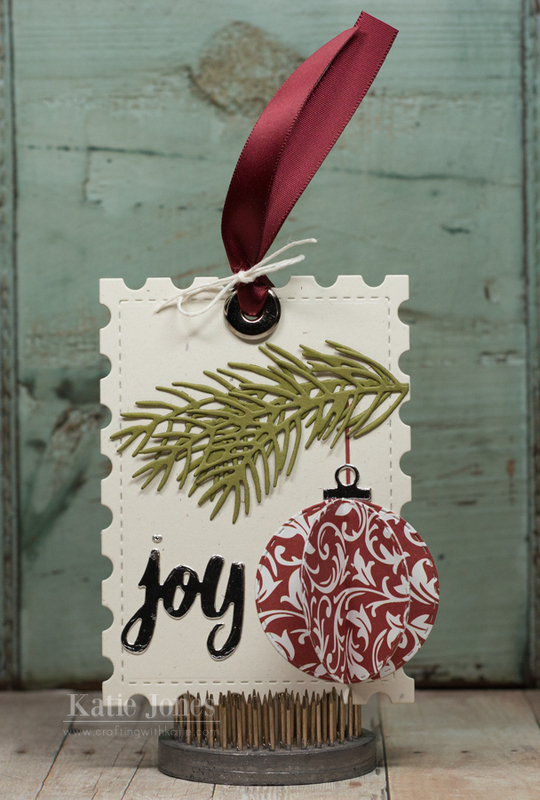 Love the pine boughs, the postage shape of the tag base, and that awesome dimensional ornament! Pretty details! I love how the stamp die looks for a tag base. Your 3D ornament is so pretty hanging from the branch. Beautiful job.